You'll be £13.50 closer to your next £10.00 credit when you purchase Flight Craft 6: Il'yushin/Beriyev A-50. What's this? Brought out in the late 1970s as a successor to the obsolete Tu-126 airborne early warning aircraft, the A-50 co-developed by the Il'yushin and Beriyev bureaux is one of the most interesting military variants in the field of IL-76 military transport. Differing outwardly from the latter mainly in having a conventional “saucer” rotodome, the A-50 entered flight testing in 1980; the new Soviet AWACS entered service four years later. The improved A-50M was developed several years after that. The type continues in service with the Russian Air Force today, and the fleet is being upgraded to A-50U standard. 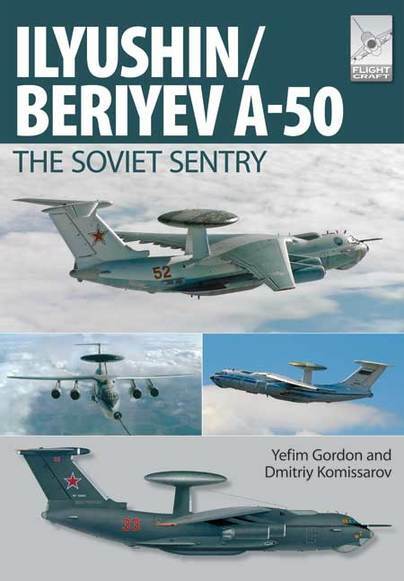 This book describes the A-50's thrilling developmental history, taking in its many variants (including the A-50EI export model for India) and gives an extensive overview of the various scale model kits covering the subject currently available on the market. A handy guide to these aircraft, and follows the usual format afforded to previous works in the Flight Craft series. There are a surprising number of kits with which to portray the aircraft and the book takes the reader through each one. Number 6 in the Flightcraft series of soft cover books from Pen and Sword, and another interesting subject from author Yefim Gordon. Based on the Ilyushin Il-76 transport, the Ilyushin design bureau worked with Beriyev who created the airborne radar system to couple with the Ilyushin airframe and thus create the Ilyushin/Beriyev A-50, with a NATO reporting name of 'Mainstay', an AWACS system equivalent to the Boeing 707 based E-3 Sentry used by NATO from the same period. The benefit of the larger airframe allowed the Russian made equipment to be fitted in easily, as the Russian equipment at that time tended to be physically larger than the NATO equivalent. So the book follows the usual format of this Flightcraft book series and after the basic introduction goes into the development story in detail, in 'Enter the Bumblebee, covering those built for use by the Russian military. The next section moves on to export customers and variants, which include India, China and even a couple to Iraq in sections 'Export Aspirations', 'Friends and Relatives' and to end this element a page on 'The Shape of Things to Come' with the most up to date development plans. Next comes a heavily illustrated section on 'the A-50 in Service' and as well as giving an interesting account of the story, the supporting colour photography used to illustrate it will be very popular for modellers as a reference. This then leads into 'The A-50 in Detail', where each section of the airframe is covered, along with appropriate detailed photos to illustrate the main points. It closes with a full fleet list of all those airframes built, with notes on their up to date status. This logically then moves onto the final 'Modellers Corner' where all the available models of the aircraft are given a critical examination. The largest are in 1/72 though it takes the smaller 1/144 before Trumpeter do one, and rounded off with some ready-made smaller scale models, including a couple of metal diecast models. This is finished off with 16 good quality colour profiles along with some assorted line drawings. Once again, this book provides an interesting look at the story of a Cold War aircraft design, and which like the US built E-3 Sentry is still in service with countries around the world as well as Russia itself.